Maine is one of the best states for weddings, given its scenery, summer weather, and many activities in the mountains, beaches, and cities. 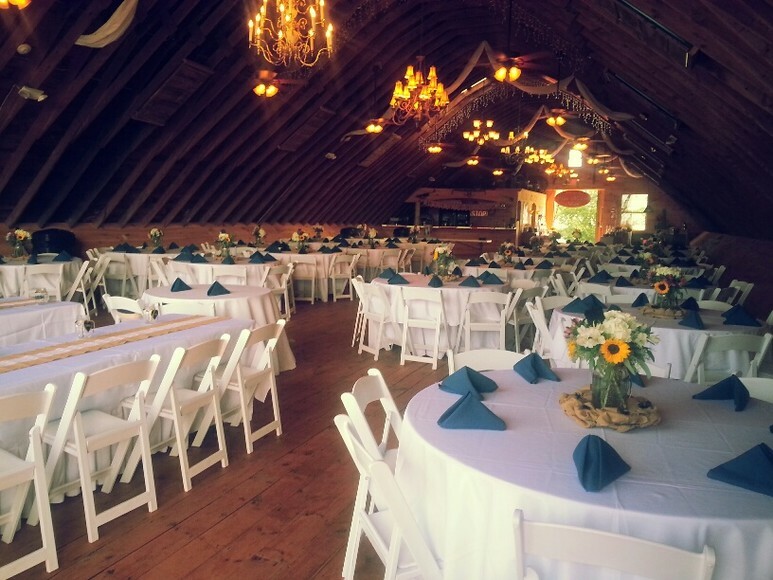 Ever more so, Maine offers a wide variety of wedding venue options. In today’s post, we’ll compare the two most popular types of Maine weddings – barn versus traditional – by Barbara Fogarty of The Maine Wedding Barn and Andrew Knight of the Agora Grand Event Center. Tell us about your venue as well as some of its history. Barbara: The barn dates back to late 1959 as a dairy farm named Tripp Crest Dairy Farm. It hosted 147 heifers in the bottom of the barn and 20 thousand bales of hay in the now reception area of the barn. It ceased operation in 1987 and was falling to ruin when we purchased it in January of 2012. We renovated it and hosted our first wedding in September 2013! The location, views, and grounds really did choose what the barn was going to be used for. 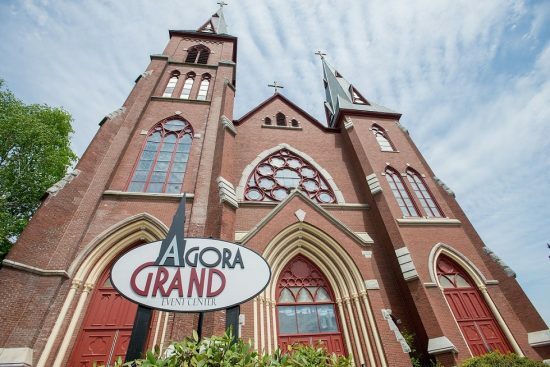 Andrew: The Agora Grand was created from the former St. Patrick’s Church, which was built in 1890 to serve the growing Irish immigrant population of Lewiston. Its unique two-steeple design reached 220 feet, making it Maine’s tallest building for the past 127 years. The church closed in 2009 and we purchased it in 2014. In 2015 we opened the Inn at the Agora, a small and luxurious boutique hotel, from the former rectory, and began renovations of the church proper. In 2016 the Agora Grand opened and hosted a dozen weddings and several community events. What are some of the amenities your venue includes? How long is your rental period? Barbara: The Maine Wedding Barn includes the ceremony and reception site, full staff of parking attendants, bartenders, setup/takedown and cleaning staff, day-of coordinator, ADA compliant restrooms, tables, chairs, linens, lighting, additional farm/barn decorations, and the Bridal Farm House for the get-ready area. Our rental period is from 9am to 10pm the day of the wedding, allowing ample time for you to decorate. Take a look at our website, which has more information. Andrew: Wedding packages at the Agora Grand include the Reception Hall, Traditional Chapel, Balcony Wedding Party Lounge, and Tower Honeymoon Suite. We include a large dance floor, custom uplighting, a built-in professional sound system, ADA accessibility, tables, chairs, dishes, flatware, and full-service bar with bartenders. Our typical rental is 8am to midnight, with the opportunity for a rehearsal the evening before. What additional items do couples need to rent? Barbara: Nothing! You’ll need to contract with a caterer, DJ, baker, florist & photographer. Andrew: Couples provide their own decorations, centerpieces, and linens. 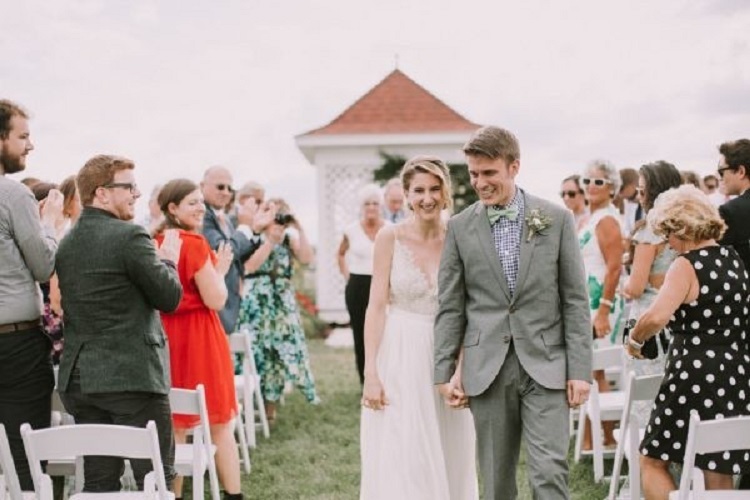 Like the Maine Wedding Barn, they’ll also need to contract with a caterer, DJ, baker, florist, and photographer, but we have a great list of preferred vendors to help! What questions should a couple ask when choosing a venue? Is there staffing to assist or a day-of coordinator on site? Is parking on-site and plentiful? Are there bathrooms or do we need to rent port-a-potties? What do we need to rent? Tables, chairs, linens, lighting, port-a-potties, bartenders, tents, etc. Are there restrictions on noise? Where are the nearest hotels for my guests to stay? Many barns are very rural, often at least 30/40 mins from hotels, restaurants, etc. Are there plenty of restaurants, bars, and activities for my out-of-town guests? Do you work with exclusive vendors or caterers? If you are required to hire particular vendors, it could cost you thousands of dollars more. If you have any special needs, make sure to ask about them sooner than later. For example, if you want your pet in the wedding, ask if the venue is pet-friendly. If a family member is disabled, ask if the venue is ADA accessible. If you have a specific dietary restriction, make sure that there caterers can accommodate you. What tips or suggestions would you offer brides in selecting a venue? Do your research as not all barns and venues are created equal. Spend the time to research and educate yourself, visit the barn/venue and gather all information before making your decision. Don’t go by price alone before knowing all the facts. If the venue doesn’t list its rates on their website, ask why? If it is during the wedding season, do a drive-by during an event so you can see exactly how it looks. First, visit several venues in person. Websites, pictures, and reviews can only say so much. How do you feel at each venue? When you tour, ask lots of questions, establish a good rapport with the staff, and let your enthusiasm show! Remember, you are not just choosing a venue – you’re establishing a relationship with the people who are going to make your wedding dreams come true! At some point, make sure to determine the total cost of your wedding at the venue, including everything you need to rent. Most venues will be happy to give you an estimate or quote, but make sure to compare apples to apples – for example, if one venue provides the ceremony location and another doesn’t, you’ll have to factor in this cost. Why is Lewiston/Auburn, Maine, a great place to get married? Barbara: With regards to our barn, we are only a 7-minute drive from the top hotels, restaurants, shopping malls and theatres of Lewiston/Auburn. Many other barns 30 to 40 minutes away from such luxuries. Andrew: Lewiston/Auburn is an adorable little metropolis right in the middle of everything – within an hour’s drive are mountains, beaches, and hiking – and the cities themselves are full of great restaurants, nightlife, and theaters. Lewiston was just named one of the top 25 cities in the United States to retire by Forbes magazine! How do barn weddings and traditional weddings differ? Typically, the ceremony in a country wedding is outside, while the ceremony in a city wedding is inside. Barn weddings are all about the authentic wood, history of the working farm, surrounding fields (hay fields), and country star-lit skies. Taking the party outside: barn weddings and receptions allow guests to enjoy the country air, views and stars. Most city venues have their activities inside, leading to a more restrictive use of the property. Andrew: I agree with Barbara that one major difference is the focus on inside versus outside. However, another difference is the proximity to city amenities. 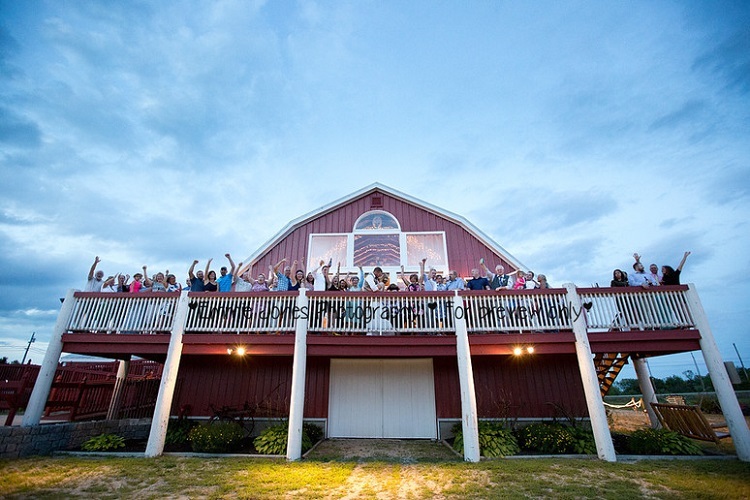 Typically, barn weddings are not convenient to city activities and restaurants, so couples need to make sure that plenty of entertainment is available on-site. (Luckily, this is not true of the Maine Wedding Barn.) The Agora Grand, on the other hand, is located in downtown Lewiston, in walking distance from lots of great restaurants, bars, and hotels. Another difference is city weddings tend to be more traditional, elegant, or modern, while barn weddings tend to be more rustic. What is your favorite part about hosting weddings? Barbara: Seeing and witnessing the start of a new journey between two beautiful people! We thoroughly enjoy servicing our couples and ensuring all their expectations for their special day has been met and exceeded their expectations!! For more information about Maine wedding venues, check out the Best Wedding Venues in Maine. Also, if you’re worried about whether barn weddings may be out of vogue, check out our blog post on whether barn and rustic weddings are on a downward trend.